Tuesday, April 7, 2020, 11:00 A.M. The Chrism Mass gathers the faithful at the mother church of the diocese to prepare for celebrations of Christ's Resurrection. Chrism is a Greek word meaning "an anointing" and oils are prepared with olive oil, balsam and other ingredients. 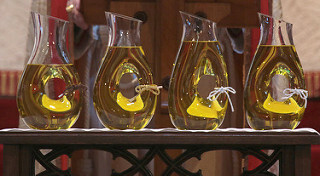 In the early church bishops baptized catechumens at the Easter Vigil with blessed oils. Over time this blessing was made earlier so oils could be used at the local level. This tradition includes blessing the oil of catechumens (adults preparing for baptism), oil of the sick (for anointing) and chrism (for baptism, confirmation, ordination of clergy, and consecration of altars). The Chrism Mass highlights ministry. A bishop's apostolic ministry is extended symbolically by the chrism clergy use in baptism and other rites. Clergy also may take fermentum (consecrated Eucharistic bread) as a sign of the communion of the diocese. 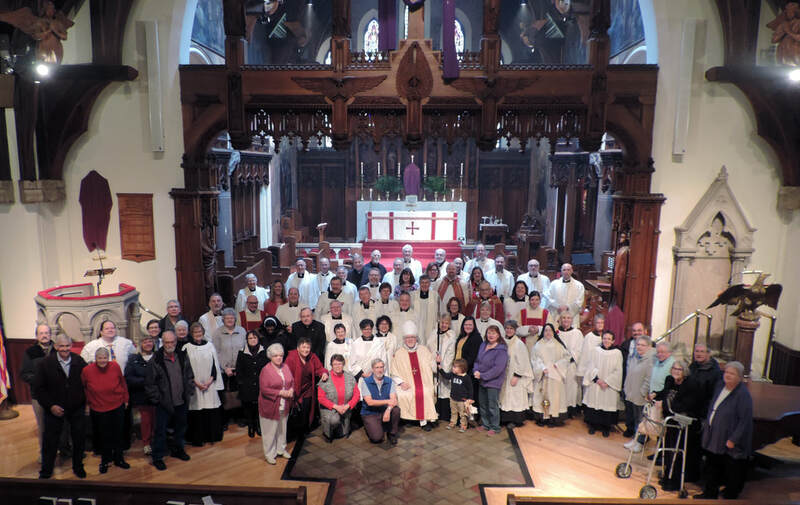 The cleric's ministry is reaffirmed by renewal of vows made at ordination. The laity's ministry is reaffirmed by renewal of the Baptismal Covenant. We hope you are able to attend this liturgy with special intention to support the ministry of all baptized, especially those who are ordained. Vest in Cassock, Surplice, White Stole in Gulick Hall by 10:50 to process and sit in the choir. Bring used Holy Oil vials to be cleaned and re-used. If fermentum is desired, remember to bring a pyx. A photo of diocesan clergy is taken immediately following the Mass. God's gift of oil, made from the fruits of the earth, has been an essential part of human history. Oil is a key ingredient in cooking, it is a fuel for lamps and stoves, it is a salve that soothes and strengthens. Oil has also been used to designate a change in the relationship of a person within the community. Thus those who are designated priests, prophets, rulers and the baptizes have been traditionally anointed, giving them their new status. Episcopalians are called together each year for the celebration of the Chrism Mass during which the holy oils are blessed. This celebration is one of the key times of the year that the many ministries of the Church are made manifest. This Mass reveals the nature of the broader Church, which is led by the bishop. The Chrism Mass also serves as an opportunity for the priests and deacons who serve with their bishop to renew their commitment to join in the ministry of the Gospel through the exercise of the ordained ministry. 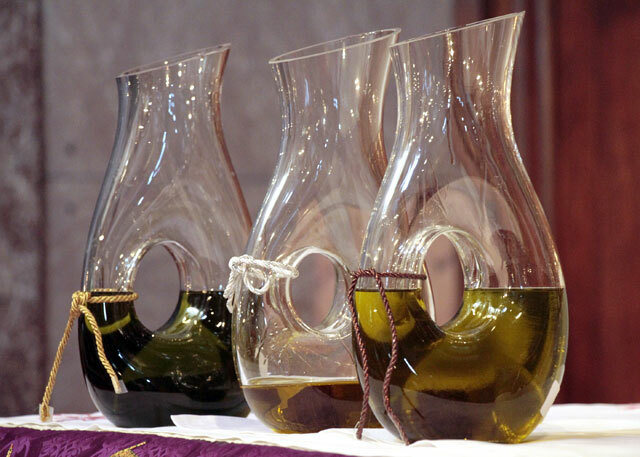 ​The primary reason for the Chrism Mass is to bless the oils that will be used in ministry around the diocese. The Oil of the Sick, to which St. James refers, is used within the celebration of the anointing of the sick in order to bring God's strength to those in need. It is the prayer of the Church that those who celebrate this sacrament will bear the suffering caused by illness, to face the trials caused by advancing age, to remain steadfast in faith, and to obtain the forgiveness of sin. The Oil of Catechumens is blessed to strengthen those preparing for baptism to avoid sin and to take on the habit of Christian living. Through this anointing, the Church prays that the catechumens will grow in faith and renounce all evil. Although the other oils are blessed, the Bishop consecrates the Sacred Chrism. In baptism Christians enter the womb of the Church to be reborn in Christ. As they emerge from the waters of baptism, they are anointed with Sacred Chrism to show their unity with Christ who was anointed as priest, prophet and king. Like Christ, all Christians are called to offer their lives totally to God, to proclaim the Good News of God's love, and to be faithful stewards of all that God has given them. Confirmation, which has its meaning only in relationship to baptism, symbolizes the gift of the Holy Spirit which has given new life. Chrism is also used in the ordination of priests and in the consecration of altars and churches. In each case, when Chrism is used, the identity of that being anointed is changed forever.